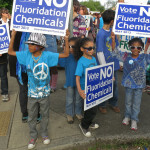 The voices speaking out against fluoridation include Food & Water Watch, Columbia Riverkeepers, and local chapters of the Sierra Club and the NAACP. Contradictory to the pro-fluoride campaign’s arguments, dental health in Oregon and Portland has actually been improving steadily across the board for the last 5 years without fluoridated water. While this tough campaign for clean, unpolluted drinking water will continue for many weeks more, on the last Thursday of April 2013, the mood was celebratory and the crowd was full of loving warmth and smiles. Previous articles from Mismanaging Perception regarding fluoridation can be found HERE. Please consider donating and volunteering to Clean Water Portland by clicking HERE. The next clean water event is this Sunday at 7pm at The Goodfoot on SE Stark. Doors open at 6pm, sliding scale from $5-20 dollars. T’was lovely to see you in the streets. Thanks for the memories. That was such a great Earth Day event.